Artist Code: 1015. Completed March 2010. Donated March 2017 to raise money for Parkinson’s Disease. 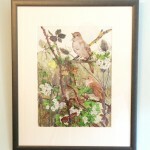 Original Water colour on Aquarelle Arches 100% hot pressed cotton rag. Unframed size 16″ x 12″. 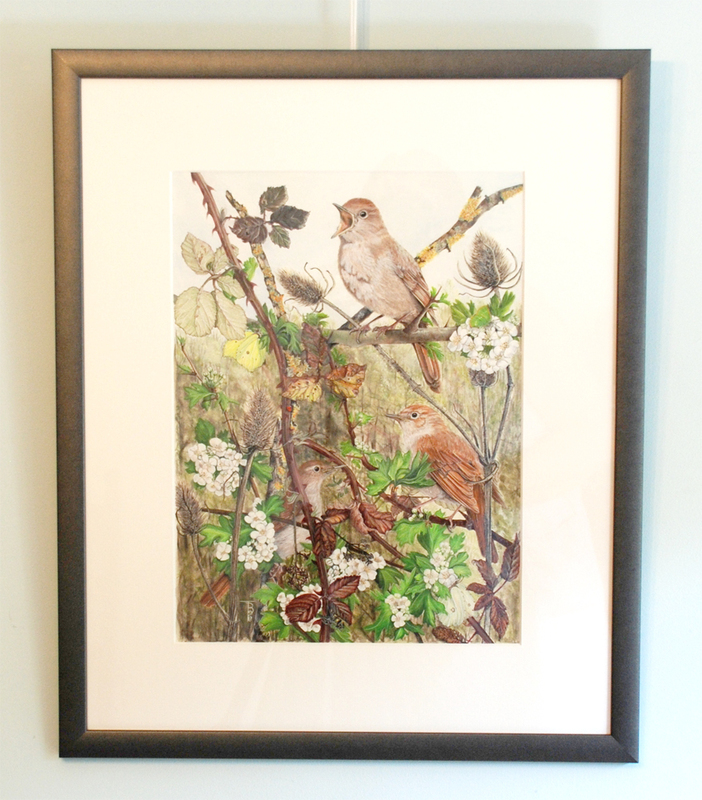 Framed size 19″ x 24″. 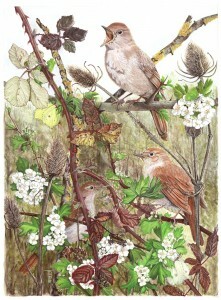 Click here to view products featuring this artwork. Nightingale, Luscinia magarhynchos, Ladybird, Adalia bipunctata, Hawthorn, Crataegus laevigata, Brimstone butterfly, Gonepteryx rhamni, Green hairstreak butterfly, Callophrys rubi, Bramble, Rubus fruticosus, Teasel, Dipsacus fullonum. Of all my natural history pictures so far, this one has required the most thought regarding the search for resource material and finding out about the bird and its habit. But it has helped me to compose what I like to think is a natural scene, of which we are having a private view. The original was painted to provide a picture of Nightingales for The Friends of Paxton Pits Nature Reserve to produce greetings cards. These are on sale in the Visitor Centre to members and visitors. He’ll win his girl before too long!